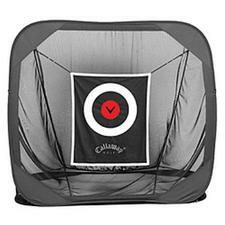 Set your feet, waggle the club and let it rip straight into the Callaway® 8-ft square practice net. The unique large square hitting area gives you plenty of room to swing freely and work on your game. The strong mesh net comes with a nylon carrying case. If you have any more questions about the Callaway Golf Quad Hitting Net 8 Foot (Indoor - Outdoor Practice Hitting Net); do not see the model you are looking for; need custom options; or prefer to not purchase online, then please call us at (630) 656-1291.